THE LAST SPONGE YOU'LL EVER want! Hundreds of super-soft, non-abrasive bristles breeze through your toughest kitchen cleaning tasks, yet are gentle on fine china, glass cooktops and non-stick cookware. Flexible silicone sponges are bacteria and mildew-resistant, plus heat-resistant and dishwasher safe! Non-slip grip surface is great for opening jar lids, too! 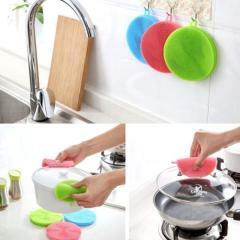 Built-in suction cups let you hang sponges to air-dry. Set of 3.